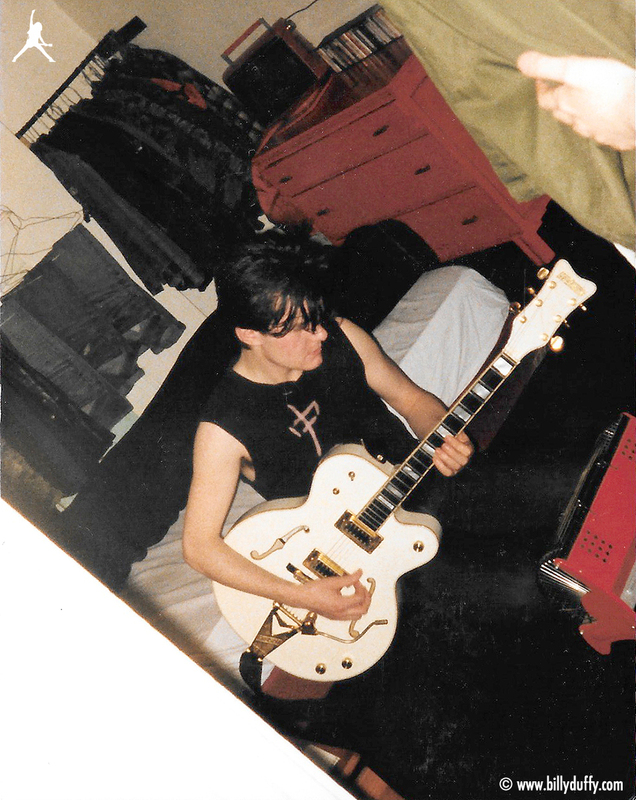 "This picture of me with my first 'single cut away' Gretsch White Falcon was taken in my room in Clifton Mansions, Brixton, London. It was probably taken by my flatmate "Little Ian" who was the Theatre of Hate merch guy. It's funny to see all those 1980's things like cassettes, a corking portable TV and the classic 3 bar portable electric fire! Boy that was "luxury" living! By the looks of my haircut (grown out, black flat top) this might be right before Death Cult was formed as by the time of the first "official" shots (me in a short 'Theatre' grey RAF jacket, white sox, dm shoes and Ian in a long coat with bandanna over his face) I had a mohawk. This photo is great as it shows the actual spot me and Ian formed the band and wrote the first Death Cult EP songs (I think 'Brothers Grimm' was first one)."